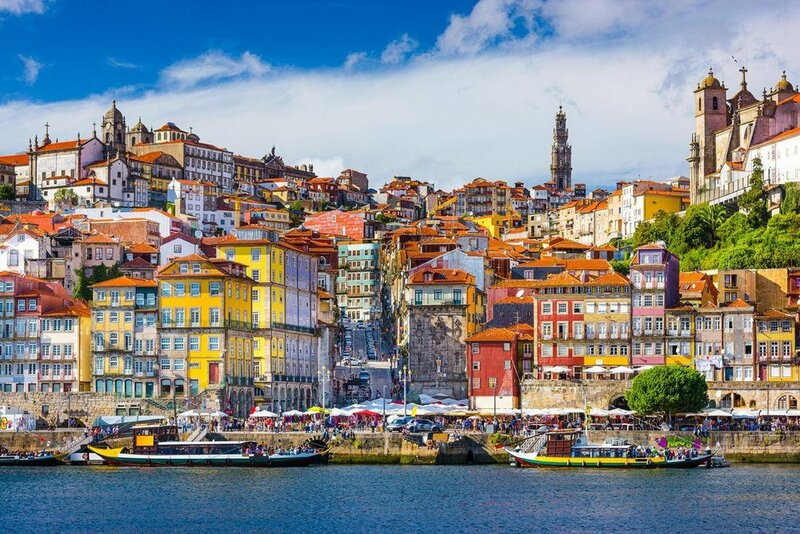 Experience Portugal at a relaxed pace taking in the important cities of Lisbon and Oporto—typical towns and villages and the stunning north-west coastline. Throughout this tour, you’ll visit the must-see attractions, including the 16th century Jeronimos Monastery which is often regarded as Lisbon’s most important landmark, it was traditional for Portuguese seafarers to pray in the chapel before their departure to the unknown; the Sanctuary of our Lady of the Rosary in Fatima, a pilgrimage site where apparitions of the Virgin Mary were reported by three local children in 1917; the 700-year-old university library in Coimbra; the Arabian Hall and the Church of Sao Francisco in Oporto, and the Ossuary Chapel in Evora, with its bone and skull covered walls. Globus has arranged some special treats so that you can savor Portuguese cuisine and wine. Enjoy a wine tasting at a Port wine cellar in Oporto; olive oil tasting in Belmonte (birthplace of Pedro Alvares Cabral, discoverer of Brazil), and tapas with wine at the Quinta de Aveleda winery. Guided sightseeing, visit the Church of Sao Francisco and the Arabian Hall in the Stock Exchange; wine tasting at Sandeman &Co.
Lisbon was the center of Europe’s longest-lived overseas empire. Portugal’s imperial ambitions date back to Prince Henry the Navigator’s 15th-century discoveries in West Africa. Morning sightseeing with a Local Guide features a drive through the Baixa quarter’s main squares. Then, enjoy a walk through the cobblestone alleys of quaint ALFAMA, the popular quarter of the seamen and Fado singers. Drive along the grand Avenida da Liberdade up to Pombal Square, and stop for pictures of Belem Tower and the Monument of the Discoverers. Also visit JERONIMOS MONASTERY with the tomb of Vasco da Gama. An exciting optional excursion to the royal palace of Queluz is available, as well as dinner at a typical taverna with Fado-style entertainment. Stop in medieval Obidos and go back in time as you pass the main gate in the impressive perimeter wall and walk along the narrow streets. Continue to Alcobaça to visit the CHURCH OF SANTA MARIA MONASTERY, built in the 12th century for 999 Cistercian monks. See the elaborate tombs of King Pedro I and his Castilian lover, Inês de Castro. The fishing harbor of Nazaré is the perfect place for a leisurely lunch break. In the afternoon, mix with the pilgrims at the country’s hallowed national shrine, Fatima’s SANCTUARY OF OUR LADY OF THE ROSARY. Overnight in Tomar, the historic seat of the mighty Order of the Knights of Christ. Visit the hilltop CONVENT OF CHRIST with its famous Manueline Window. Continue to Coimbra, strategically situated on a hill overlooking the Mondego River. After a visit to the gilded baroque LIBRARY of its 700-year-old university, drive by ancient Buçaco Forest on your way to Oporto, Portugal’s second-largest city. 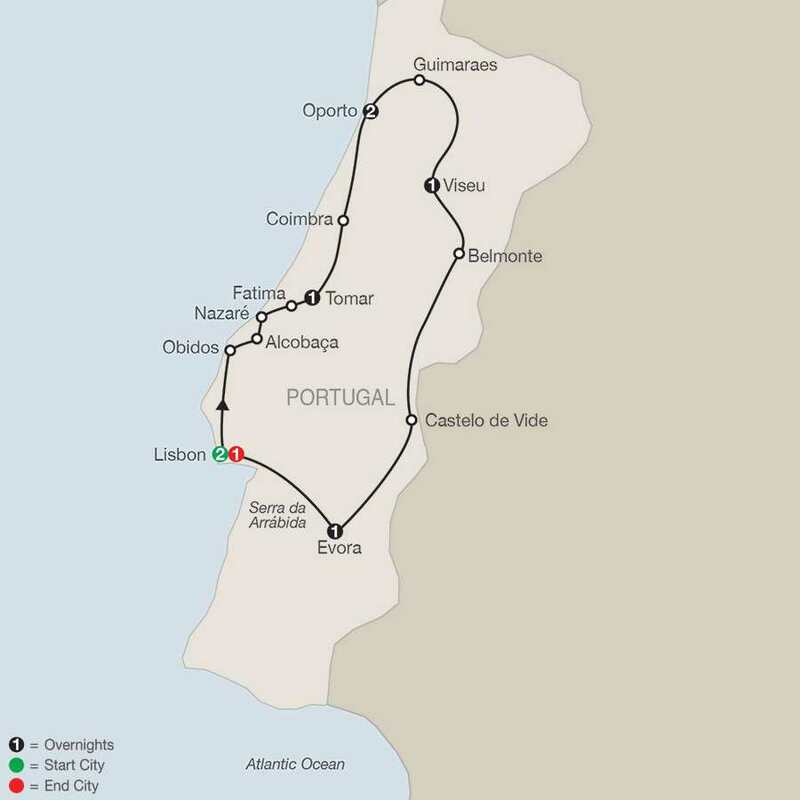 Tonight, why not join an optional cruise on the Douro River, followed by dinner at one of Oporto’s fine restaurants? Sightseeing with a Local Guide includes a panoramic drive to the mouth of the Douro River, the soaring cathedral, the richly decorated CHURCH OF SAO FRANCISCO, and the STOCK EXCHANGE with its contemporary ARABIAN HALL, inspired by Granada’s Alhambra. Next, visit the famous Sandeman & Co. PORT WINE CELLAR to taste the Port wine produced from grapes of the Douro Valley. Enjoy a walk through the medieval center of Guimaraes, often referred to as the “Cradle of Portugal” because of its association with the country’s first king, Alfonso Henriques. Next, taste Portuguese tapas at the Quinta da Aveleda WINERY and visit its splendid GARDENS. From here, a scenic road through the port wine vineyards leads to Viseu, where a dinner of local specialties and wine awaits you at Forno Da Mimi restaurant. This morning, stop in Belmonte, today a symbol of Jewish awakening, for a visit of the JEWISH MUSEUM. Also enjoy an OLIVE OIL TASTING, for which the area is famous. Afternoon break in Castelo de Vide, with time to walk through the Jewish quarter with its white-washed houses and its medieval synagogue. Before arriving in Evora, the cultural center of southern Portugal and a former royal residence, visit a CORK FACTORY and learn about the many ways this material can be used. A massive wall surrounds Evora’s medieval center, classified as a UNESCO World Heritage Site. Follow your Local Guide on a walking tour through its narrow alleys to the Roman Temple, the early gothic CATHEDRAL, Portas de Moura fountain, and SAO FRANCISCO CHURCH. Visit the OSSUARY CHAPEL, whose walls are covered with thousands of human bones and skulls. Tonight, enjoy a special farewell dinner with your traveling companions at a local restaurant.